Music Star, Davido in Another Drug Mess - e-NIGERIA! Davido and crew doing drugs e-NIGERIA! Time and again, star musician David Adeleke famously known as Davido had been linked to drugs. Davido, son of multi-billionaire Deji Adeleke is among Nigerian celebrities who are perceived by the public as drug addicts due to his aggressiveness. 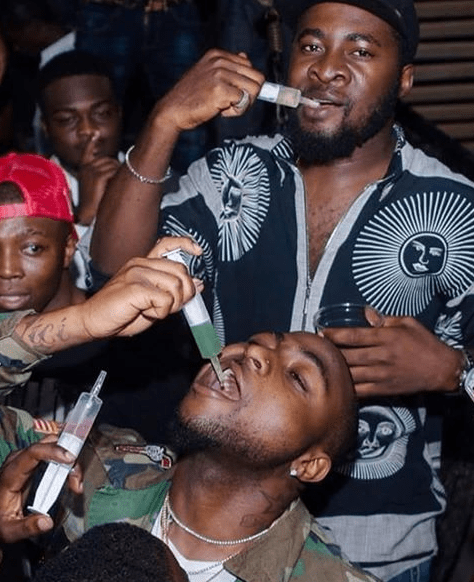 A couple of hours ago, the highly controversial singer, yet again posted photos of himself and his crew ingesting a liquid substance suspected to be tramadol via syringe. The said photo had since generated serious controversy online, however, the singer who is not new to controversies seem to not give a damn. Meanwhile, it is also perceived that Davido’s high level aggression and that of members of his crew are born out abuse of drugs.